With use of a wall rack the user can save space on the floor and make the heater more efficient by directing the air flow easily. The heater is very easy and fast to set to a wall rack. Wall rack is also a perfect place to keep the heater when not needed in other places for occasional use. The heater can be turned vertically and horizontally in the wall rack. In humid places or buildings where the heater will have to be set high, it should be aimed to blow the air down to a floor. This also helps to dry wet floor conditions. When directed downwards the air flow keeps the floors warm and prevents the warm air from staying up on the ceiling. Near opening doors the correctly pointed heater cuts the cold air from coming in. The heater is easy to to be placed on the rack fast. On the rack the heater is easy to turn but automatically locking rack doesn't turn by itself. 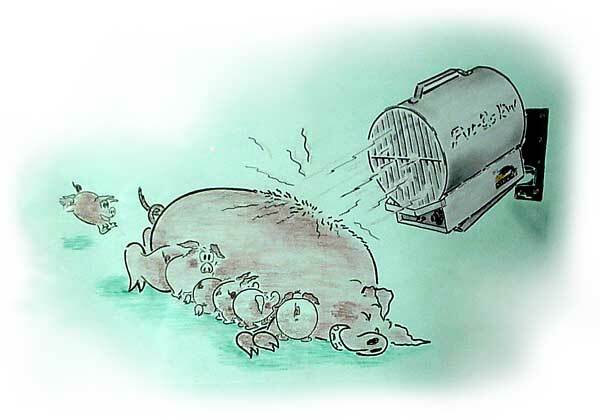 Especially the PVT-heater in animal buildings should always be set high enough so that animals can not reach it. In big and high buildings the directing of air flow is very important for heating and drying the objects needed to work with. For example drying the car after driving in wet road conditions is fast with pointing the heater to a floor of the garage. The worst condition for car in the garage is a warm and steady humid air.